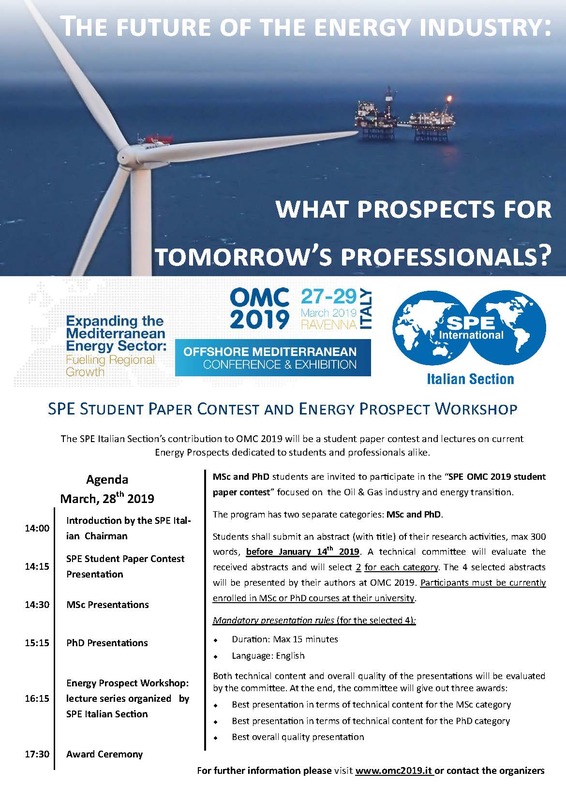 The SPE Italian Section’s contribution to OMC 2019 will be a student paper contest and lectures on current Energy Prospects dedicated to students and professionals alike. MSc and PhD students are invited to participate in the “SPE OMC 2019 student paper contest” focused on the Oil & Gas industry and energy transition. The program has two separate categories: MSc and PhD. Students shall submit an abstract (with title) of their research activities, max 300 words, before January 14th 2019. A technical committee will evaluate the received abstracts and will select 2 for each category. The 4 selected abstracts will be presented by their authors at OMC 2019. Participants must be currently enrolled in MSc or PhD courses at their university. For further information please visit www.omc2019.it.